My colleagues and I recently opened Hawksmoor Borough, with a small self-contained Cooks' Room complete with its own kitchen. This serves as a creative hub for all our restaurants, and as a unique private area for 16 of our customers. 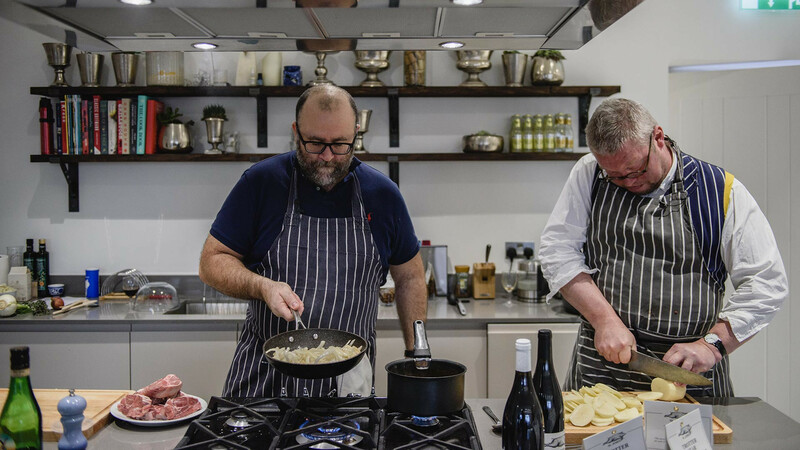 We're hosting a series of chefs' events in the Cooks' Room, where we asked some of our personal food heroes to create their own version of a Hawksmoor meal. We kicked off this series with the mighty meat maestro Fergus Henderson, who took over for one night only, putting his spin on our food. His menu included roast beef atop a dripping trencher, and a side of 'What a Baked Potato' drowned in his 'Trotter Gear' – braised, chopped pigs' trotters of so unctuous it should probably be illegal. The son of two architects, and a self-taught chef, Fergus has become known as the father of 'modern British' cooking and is considered a major influence on most British chefs (including myself, but more on that later), as well as some over-the-pond counterparts such as Anthony Bourdain, David Chang and Mario Batali. "It's only polite to eat the whole animal," Fergus writes, but the truth is that he is just as adept with vegetables and bread. He first received acclaim while at the dining room at The French House in Soho. He later met restaurateur Trevor Gulliver and the duo bought an abandoned smokehouse on St. John Street in a then-dilapidated neighbourhood on the edge of London. St. John was born and won Moët & Chandon's Best Overall London Restaurant in 2001, received a Michelin star in 2009, and is regularly included in the worlds' top 50 restaurants by various arbiters. In its 20 years in Smithfield, St John's daily-changing menu has shone a light on the delights of sweetbreads, kidneys, tongue and pig trotters. However, the two men behind London's altar of British cooking had no interest in being cutting edge at all. They just wanted to cook honest food they believed in, and the food in St. John is just that; simple, decadent, honest, and impossibly British. It would be so easy to devote this entire article to singing the praises of St. John's food; the decadent bone marrow, the apple-fresh slices of kohlrabi, the wondrous smell (and taste) of the plump, perfect madeleines baked into seashells. To wax lyrical about the airy, bouncy, sourdough loaves made daily in the open bakery and stacked on the bar. To go on about Trevor's hand-selected wines, from heady burgundies to floral, curt whites including several from their very own vineyard. But there's more to St. John than simply the food and drink. Fergus defies the old vision of a legendary chef. His kitchens are happy places, conducted with love, humour and efficiency. In St. John kitchens there is no shouting, shaking or throwing of pots and pans. 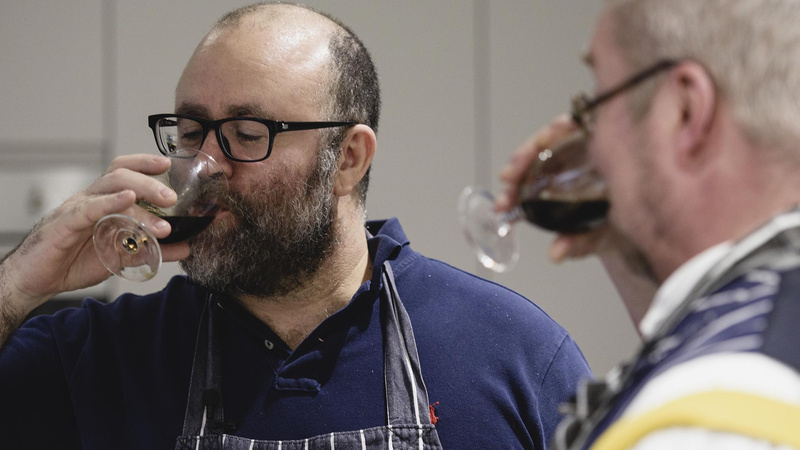 Fergus believes aggression can be tasted in the food and was one of the first notable chefs to instil kindness in the kitchen, with teamwork as the order of the day. Food is affected by the spirit of its chefs and a happy kitchen makes for happy food. I subsequently realised I'd been living a lie for ten years and didn't want to eat the food I had been cooking. If St. John were a person, it would be plump and jovial, with a grin on its face and a glass of red (or Fernet Branca) in its hand. It might look a lot like its founders, Fergus Henderson and Trevor Gulliver. But make no mistake, their jolly façades conceal passion and a firm focus. My own history with St. John started shortly after the turn of the millennium with a chance lunch at St. John Bread and Wine. After years of working in three-star Michelin restaurants, I was moved to tears by its simplicity, indeed it would be no overstatement to say I had something of an epiphany. I subsequently realised I'd been living a lie for ten years and didn't want to eat the food I had been cooking. A profound change of mind was closely followed by a change of course. Fergus has written two cookery books, the seminal Nose to Tail Eating: A Kind of British Cooking, and the 2007 sequel Beyond Nose to Tail. They have also been combined into The Complete Nose to Tail which, if it isn't on your bookshelf already, I urge you to purchase forthwith. Being somewhat long in the tooth to work at St. John, I have used these bibles to guide and inform my own cooking. Over the years, I've got to know the St. John duo, between late nights in the Groucho and subsequent food tours of foreign climes, and it seemed obvious that they should host the inaugural Cooks' Room dinner. Hosting future chefs' events, we have Nathan Outlaw, Stuart Andrew, Nieves Barragán Mohacho, Tom Adams, Elizabeth Haigh (neé Allen), Lee Tiernan and Robin Gill, with more international chefs to be announced. All proceeds from this series of guest chef dinners will go to Action Against Hunger's #UniteAgainstFamine appeal. Interest piqued? Head to thehawksmoor.com/cooksroom for info. Richard H Turner is a meat consultant for Meatopia, Hawksmoor, Foxlow, Blacklock, London Union, Pitt Cue Co., Turner and George. If you enjoyed his column on St John, you can read more of his writing here.